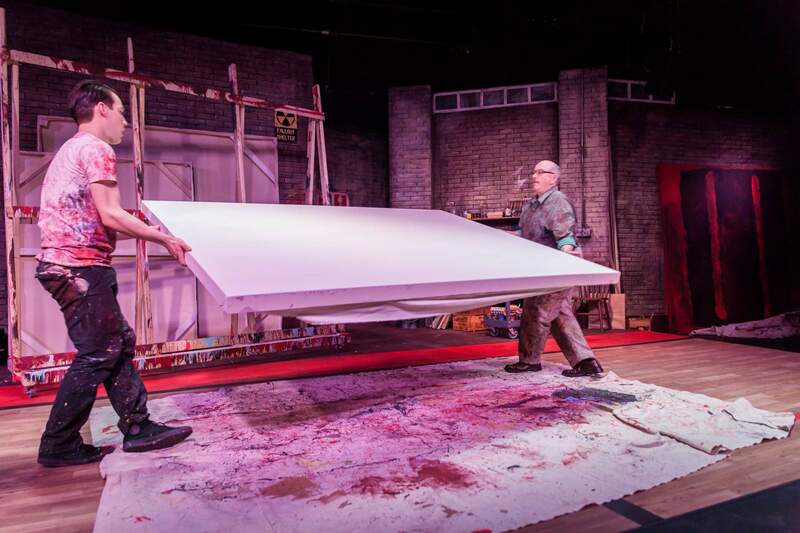 Rothko (Dennis Elkins) and Ken (Craig Dolezel) roll out the canvas for a work session in John Logan’s “Red” at the Pagosa Springs Art Center. 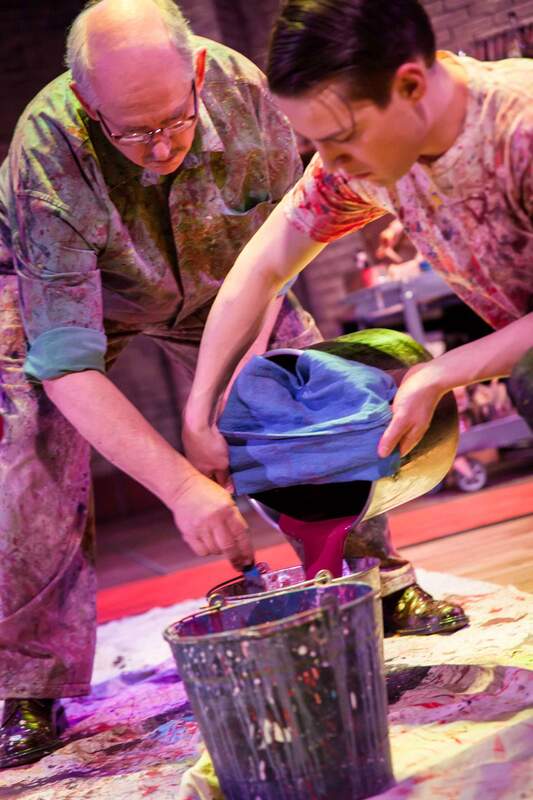 Rothko (Dennis Elkins) and Ken (Craig Dolezel) mix and prepare paint for a work session in John Logan’s “Red” at the Pagosa Springs Art Center. The scene takes place in the midst of John Logan’s stunning two-person play, “Red.” The 90-minute work dramatically explores the purposes and ideas of art in waves of thought-provoking dialogue. But it’s not all talk. It’s not a lecture about art but a generational tug of war. Logan’s master-class format is rife with physical work – mixing paint, sanding frames, preparing ground for large canvases and laying on swaths of color. It’s full of comings and goings, meditative moments and explosive conflicts – all to explore big themes. “Red” opened in London in 2009, won a bunch of Olivier Awards and then it transferred to Broadway the next year. Both productions featured Alfred Molina and Eddie Redmayne as Rothko and Ken. In New York, “Red” won Best Play, Best Director and Best Featured Actor in the Tonys. Now this spellbinding work is playing at the Pagosa Springs Center for the Arts. Directed by Melissa Firlit, the local production is intelligent and well-paced with a remarkable set and excellent technical support. Two superb performers, who have earned their Actors Equity credentials, create the old man and the neophyte who has arrived at the door. Dennis Elkins, chairman of the Fort Lewis College Theatre Department, brings to life the towering figure of Mark Rothko, a leading abstract expressionist in mid-20th century America. His outsized ego and ferocious defense of the great traditions of art have been challenged by a commercial project for which he needs assistance. The commission and Rothko’s stormy personality are based on fact. In the late 1950s, at the height of his career, Rothko was asked to produce a series of monumental paintings for the avant-garde Seagram Building in New York City. Craig Dolezel, a New York actor via a Rutgers University master’s degree, evokes the young, fictional assistant, Ken. He enters the maelstrom of Rothko’s studio to help the master complete the commission. At the outset, Ken is dutiful, but soon the two spar like combatants. What’s at stake is the struggle between young and old, the transcendence or folly art, the meaning of life and the inevitability of death. The Pagosa production is strongly supported by Tim Moore’s sound and Erika Lake’s light design. Rothko’s preference for classical music – Beethoven, Mozart and Chopin – is challenged by Ken’s jazz, yet another way to exacerbate the generational divide. John Santangelo’s brick-walled, realistic set is grounded in research on Rothko’s original basement studio with its old basketball floor and room for works in progress. The paintings have been recreated by Denver artist Jill Spears and add greatly to the atmosphere. Play or film, Logan is a fine storyteller, as evidenced by his many screenplays. They include: “Gladiator,” “Aviator,” “Star Trek: Nemesis” and “Skyfall.” But “Red” may be closer to the playwright’s heart than Bond films, including the next two, which he has been commissioned to write. In “Red,” he explores the tantalizing argument between art-as-commerce and for-art’s-sake, not to mention the grandeur of human endeavor in the face of temporality. “Red,” a play by John Logan, Thingamajig Theatre Company, directed by Melissa Firlit, featuring Craig Dolezel and Dennis Elkins, 7 p.m. Friday, Saturday, May 30 and 31; and 2 p.m. Sunday and June 1. Pagosa Springs Center for the Arts, 2313 Eagle Dr., Pagosa Springs, free parking. Tickets are $18 to $20, reserved or at the door. For more information, visit www.pagosacenter.org, call 731-SHOW (7469) or email tim@pagosacenter.org.